I love the beginning stages of the finishes. The walls are up, lighting is in, floors are done, and now for the jewels: the drapes, pillows, wallpaper, upholstery, etc. What makes a room your own…. What color should you paint your ceiling? This is an old post but I got asked this a few times recently so thought I would repost for today. The short answer? It always depends. Some decorators use the 8 foot rule: If your ceiling is less than 8 ft high, then paint it 2 tints lighter than the wall color. (Tint just means the color has more white in it and is therefore lighter. If it had more black in it, you’d say it was a shade darker). If your ceiling height is more than 8 feet, paint it 2 shades darker than the walls. Other decorators feel that painting a ceiling white always makes it feel lower than it is. I disagree with this. It’s true that when you break up the color – when the wall color is different from the ceiling color – your eye notices the change. But if the ceiling is lighter than the walls, and especially if it has a semi gloss finish to it, it actually looks more expansive and higher. But you may need to play with this a bit, because if your walls are really dark, then the change from dark (walls) to light (ceiling) is much more noticeable and therefore the ceiling appears closer. Another trick to make that ceiling appear higher is to bring the ceiling color down the walls a bit: paint the same color on the ceiling a foot or so down onto the wall. This makes the ceiling appear taller than it is. Painting a ceiling is definitely a personal choice. There really is no wrong answer. Just decide the effect you want and go from there. As I always say, if you don’t like it, you can always paint it over! The remodel is almost complete! Even without the furniture in the transformation looks amazing. Fun project! I recently decorated a mid century style living room that had an open floor plan. One wall in the room was completely paneled, including a built in cabinet. Removing the wall paneling was the best thing I did to bring the entire space together. Once the drywall was up and painted, I moved the dining table from a small area off to the side to the more open space behind the sofa. I defined the area as a dining room by centering a fixture above the table and anchoring the table and chairs with an area rug. Having the walls all the same material and color made the room feel more cohesive and helped the stone fireplace stand out more. The paneled cabinet will be removed at a future date, so painting it the same color as the wall helped to deflect – rather than emphasize – the panels until they are finally gone for good. I recently helped a client get her dining room ready for Christmas. When she called me we had just under four weeks to make the room feel more inviting and warm before 18 relatives descended upon her. She was a quick decision maker and excellent notetaker, so while I gave direction, she quickly executed. We started with a new wall color – a warm gray. There was a nice sized hole in one of the plaster walls and no way to get a painter in by Christmas. My client patched and painted by herself like a pro. Next we pulled new drapes in a bold pattern and a wool rug with soft lines to give the room more texture. A print on one wall was replaced with a striking mirror that added a lot of interest and helped bounce light around the room. Vases, lots of red and silver accents, holiday plants, and lights strung from the drapery rods added holiday charm and warmth. Good job CM! One of my clients has three boys ranging in age from 8 to 2. One of the first things I noticed on our initial consult was how unsafe the railing was at the top of the basement stairs. The railing would move if you leaned on it, and three boys were surely to lean on it and more. So replacing it was a priority. The stairs opened up to the kitchen and dining room. I wanted to better define the space between the two areas, but I didn’t want to block off the stairs completely, since the glass brick window over the stairs provided natural light. My solution was to design a sturdy half wall with a nice cornice and base molding to match the rest of the space. The wall was painted the same color as the main floor, but the window wall was a different color, again to help define the two spaces. The wall is beautiful enough to fit the space and sturdy enough to handle the boys. Last week I attended a seminar on Benjamin Moore’s 2011 color schemes. These are not new colors; rather they are 18 existing colors that Benjamin Moore has arranged in three palettes of six to help you convey a certain mood in your home. The three moods are Dreamy- which has sophisticated, subtle hues; Spirited-a bold palette with high contrast colors; and Soulful-a selection of warm hues and rich tones. Pick two to three colors from each palette to create the color experience you want to create. The combinations are flawless: each color works perfectly with the others in its palette, so you don’t have to worry about picking monochromatic grays to match or using the right value of purple. I just did my first post on my other design blog on the color yellow today. Yay! It was in reference to how yellow helps one concentrate on tasks, so it’s a good color to have at your desk when you need to work. Image from Elle Decor. Decorator Joe Nahem. Conversely, ElleDecor had a great article today on the color green. Green relaxes the mind and calms the spirit. It’s a great color for bedrooms and bathrooms, anywhere you want to just kick back and unwind. 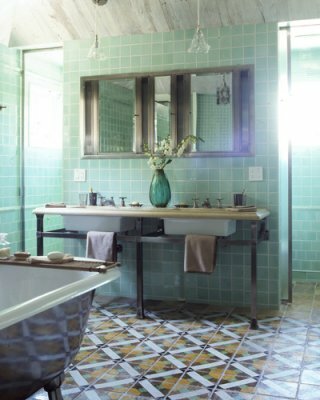 A bold green, like a kelly green, can renew the spirit; a pastel green will have a more soothing effect. From a feng shui perspective, it’s good to use green in your health area. It will enhance the chi for good health, whether it be healthy relationships, healthy souls, or healthy bodies. The green can come from paint color, furniture, pictures, or other accessories. You can further stimulate the health chi by bringing in natural (green) plants and wood. So yellow gets the creative juices flowing, and green calms you down. Got it? Good! Write both the name of the color AND the room that the paint is going in on the paint lid. Example: Airway 828 – Master Bedroom. Why should you do this? Have you ever tried to read the name of the paint in the teeny tiny lettering on the label on the side of the can? Now try it with paint dripped all over it…. If you are using painters, it’s an (almost) foolproof way to make sure the painters use the right can for the right room. If you are using more than one paint color in a room – say different hues above and below a chair rail – specify that on the can: “Litchfield Gray – dining room – below chair rail”. It may seem like an extra step, but you just spent all that time picking the right color (or hiring your fabulous decorator to choose a color for you) so why not make sure it ends up in the right place?